The HGTV series “Property Brothers” always starts with a couple oohing and ahhing over a gorgeous home that, ultimately, they can’t afford. Never fear, the twin-brother hosts help the couple find a fixer-upper that affordably mimics their dream home. That dynamic is not unlike what we encounter with some prospective brides who come to us with photos of gorgeous photos they’ve found online, such as on Pinterest. Sometimes the flowers in those photos are more expensive than a wedding budget will allow. Erica Bixby, store manager for us in Hershey, cited the example of a bride who fancies peonies. Peonies in the winter might run $25 per stem. As an alternative, she suggested polo roses, which open like peonies. “It’s very pretty, and it’s more affordable,” she said. Erica and the rest of Royer’s wedding designers can customize a wedding plan that captures the bride’s vision but also falls within her budget. Royer’s has more than 30 designers and store managers trained in weddings, many of them with 25 or more years of experience. In a single year, we’ll serve more than 500 brides, big wedding (photos above and video below) or small, start to finish. We offer wedding packages, but we also do lots of custom work. For instance, Beth Ruf, wedding designer at our Lancaster North store, helped bride-to-be Valerie Beyer with her “Alice in Wonderland” theme. Royer’s wedding consultations are free. Erica said most wedding work begins with a phone call. She will ask the bride-to-be a series of questions: name, wedding date, venue, vision. If the future bride has pictures that capture her vision, she can email them to Erica ahead of their consultation or bring them to the appointment. Erica also keeps her own book of ideas. She sets aside an hour for each consultation and recommends three months for planning purposes; flowers are ordered one month prior to wedding day. Whether it’s Erica and Stephanie Allen in Hershey, Beth Ruf at Lancaster North, or a wedding consultant at any of our other stores, you can find contact information for them here. Our wedding consultants are always happy to answer any questions that brides may have. Valerie Beyer married Patrick Tully on March 14, 2015. The Lancaster County couple held their wedding and reception at Pheasant Run Farm. Having just celebrated her first anniversary with Patrick, Valerie spoke with us about the inspiration behind her “Alice in Wonderland” theme and about working with Beth Ruf, wedding designer at our Lancaster North store. The bouquets comprised orange gerberas, orange alstroemeria, hot-pink roses, hot-pink carnations and lime-green button poms, with ti leaves looped around the outer edges like a collar. Two topiaries adorned the altar. The centerpieces were the main attraction. What inspired your wedding theme? I arrived at Patrick’s parents’ house to find a kitchen side table with lit candles and the “Alice in Wonderland” book on it. There were lights hanging from the wall leading to the basement. As I walked down the stairs and around the corner, there was Patrick on one knee. What led you to Royer’s for your flowers? We stopped in the Royer’s near my parents’ house one day to talk about flower arrangements for my wedding, and they suggested going in town to talk to Beth Ruf because she is super-experienced, creative and passionate. The Lancaster North store was convenient, and Beth’s willingness to set up my flowers was a big plus to relieve some stress on me. What are your memories of the flowers at your wedding and the reception? Just extremely beautiful! That is all that comes to mind. You had roses made from musical note paper. What’s the story behind that? That was my idea. My husband is a huge music lover, and I just wanted something in my bouquet and his boutonniere to connect the both of us as one. Can you describe what it was like working with Beth? Amazing! Perfect! Beth was willing to do whatever to make my special day perfect. There were a few times where I thought I was being a little too picky, but she was willing to make those changes while always keeping the customer (me) in mind. On this particular September wedding day, the misty weather presented some logistical challenges for the bride and groom. The ceremony that had been planned for a beautiful garden had to be moved indoors on short notice. 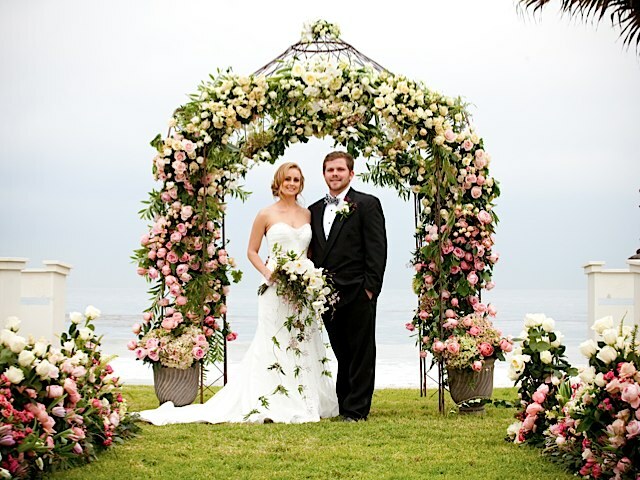 A ballroom had to be transformed into a beautiful garden setting, complete with an arch and flower-festooned aisle. As they say, into every life some rain must fall. And it was a good reminder that weather is one variable that no one controls, no matter how good of a wedding planner he or she is. If you want an outdoor wedding, it’s best to have a Plan B just in case. We all know how variable the weather can be in Pennsylvania, after all. A number of years ago, the Farmers’ Almanac solicited submissions for its “Worst Wedding Weather Contest.” After Texas and Florida, Pennsylvania tied Ohio and Indiana for the most submissions. Couples from those states “have experienced the soggiest, snowiest, windiest, most hurricane-hampered and hail-ridden wedding weather,” according to the Farmers’ Almanac. In fact, a Philadelphia-area couple won the contest’s grand prize (a warm-weather cruise) with a tale of how a record snowfall interrupted their wedding plans. So what should you consider when it comes to creating that Plan B for your outdoor wedding? There are many factors, none more important than the safety and well-being of the wedding couple and their guests. Of course, we’re pretty protective of the flowers, too. We were on hand for that misty September wedding mentioned above. Being a perishable product, flowers require a tender touch. While do-it-yourself can be tempting when it comes to flowers (and other aspects of a wedding), it’s also comforting when a professional is on hand, in good weather and bad. A florist will ensure that your flowers look their beautiful best. Unlike the weather, this is an aspect of your wedding that you can control. We hope to see you March 1 when we participate in Brent L. Miller Jewelers & Goldsmiths’ free “Best of Lancaster” wedding planning event. Gregory Royer from our Lancaster West store will be on hand for the event, which runs from 11 a.m. to 1 p.m. at 1610 Manheim Pike, Lancaster. Everyone who attends will be eligible to win prizes valued at more than $5,000 from the participating businesses. Royer’s will be giving away a bridal bouquet valued at $125. For more information, visit www.brentlmiller.com/weddingshow. Of course, the Royer’s team is always eager to assist with your wedding needs. You’ll find lots of great resources here. Talk about a night at the museum. Instead of historical figures coming to life, this is a story about a would-be florist providing flowers for a wedding at a museum. She left the flowers overnight in the museum’s old refrigerator – and they were frozen solid the morning of the wedding. Not only are we familiar with this story, we lived it. At least the part where the woman came to us in a panic, and we made all-new bouquets, corsages and boutonnières in time for the nuptials. It certainly wasn’t the first time we repaired or made new bouquets on short notice for a bride who bought her flowers elsewhere and was disappointed. Nor is it the only way that we can help to make a wedding day a little more special. We’ve been fortunate to provide flowers to many big weddings, but the typical expenditure for wedding flowers is between $400 and $1,000. We also offer affordable wedding packages. Typically, we deliver two hours before a wedding to make sure that everything is where it should be. We also offer a wedding service – for a fee, in some cases – that arrives an hour prior to the exchange of vows and stays until the bride has walked through the door and down the aisle. • Such as the time that the flower girl gave an enthusiastic hug to the bride, who was left with a nice bright lipstick stain in the middle of the gown. No problem. Our consultant pulled out her stain stick and removed the blemish. • Or the time that the bride’s gown zipper ripped just before the wedding. Our consultant reached for her needle and thread. • And the icing on the cake with all of this? It was the time that our consultant helped to ice the wedding cake moments before the reception. You’ve found Mr. Right, but understand that there’s no wrong when it comes to your wedding flowers. That’s the message that Barry Spengler, Royer’s vice president of operations, conveyed during his “Wedding Week” appearance on Fox 43. Five or 10 years ago, for instance, few brides-to-be would have thought of combining lime green and pink. Not so today. You can view Barry’s interview with Fox 43’s Andrea Michaels in the two segments below. Meanwhile, click here for wedding resources on our website. Looking for ideas for your upcoming nuptials? Perhaps you’ll find inspiration from these photos from Weddings Year Round’s bridal show, held Jan. 19 at Eden Resorts & Suites in Lancaster. The centerpiece of the event was a live wedding, for which Royer’s provided the ceremony and reception flowers. You’ll find more information about wedding packages and other wedding resources on our website. We look forward to assisting with your special day. We have some exciting news to share with you about our wedding plans. Not a specific wedding, mind you, but rather the new wedding styles and flowers that we’re working to offer brides and grooms. If you’ve followed this blog, you know about the extra effort – namely, regular trips to South America – we make to ensure the highest-quality flowers for our customers. Similarly, earlier this year we sent several Royer’s representatives to a wedding design conference offered by floral wholesaler Florabundance Inc. The event, called “Inspirational Design Days,” took place on Dos Pueblos Ranch, overlooking the Pacific Ocean near Santa Barbara, Calif.
Cheryl Brill, Royer’s vice president of retail operations, was joined on the trip by Holly Newpower and Jennifer Stout, Royer’s store managers at Camp Hill and Shillington, respectively. The experience gave them an opportunity to work with beautiful product that they typically don’t handle, Cheryl said, and to design in a natural, unconstructed way without concern for budgets, costs or recipes. 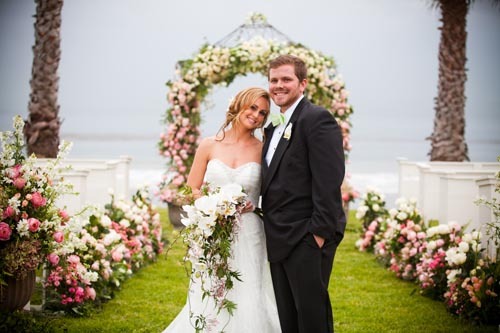 The participants designed wedding bouquets; beachside ceremony decorations; and a 30-foot-long centerpiece comprising mossy birch branches, strands of ivy gathered in the adjoining woods, and small vintage vases filled with groupings of garden roses, tulips, cut hyacinths, clematis, accented with candelabra and votive candles. As a next step, we’re training our wedding consultants on the flowers and styles exhibited at the Florabundance seminar. We’re also redesigning the wedding content on royers.com. Our intent is to provide more options for our wedding-planning customers.